With all my time spent on creating my In Color samples, I have not had time to even think about the MDS Monday blog challenges since I got home from my last California trip. Then last Monday I was traveling back to California and that is where I am now. After arriving I spent all spare time finishing an MDS photobook so I could send it to print before the printing sale ended. At that point, I could barely look at a computer screen for a day or two. 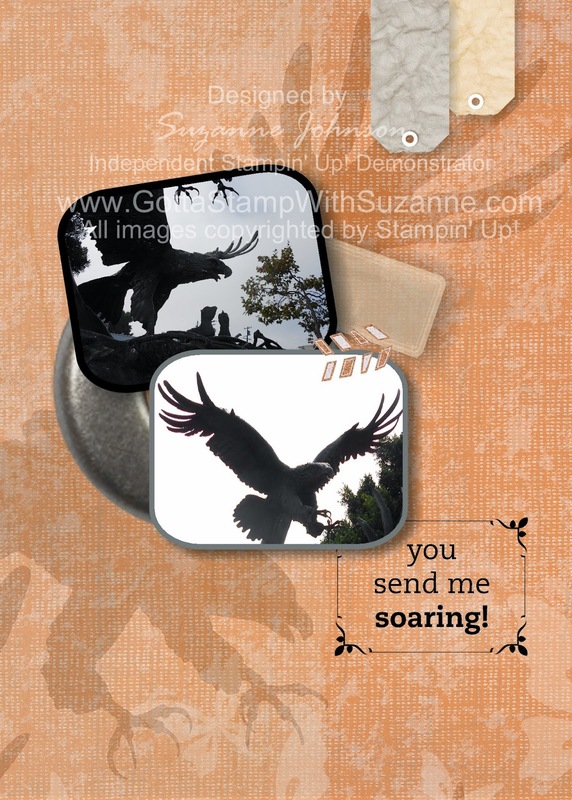 The worst thing about that is that everyone has been leaving me such WONDERFUL comments and compliments here, on Stampin' Connection and on Splitcoast Stampers, in response to my Work of Art samples. I have a lot of appreciation to properly express, and I will very soon! 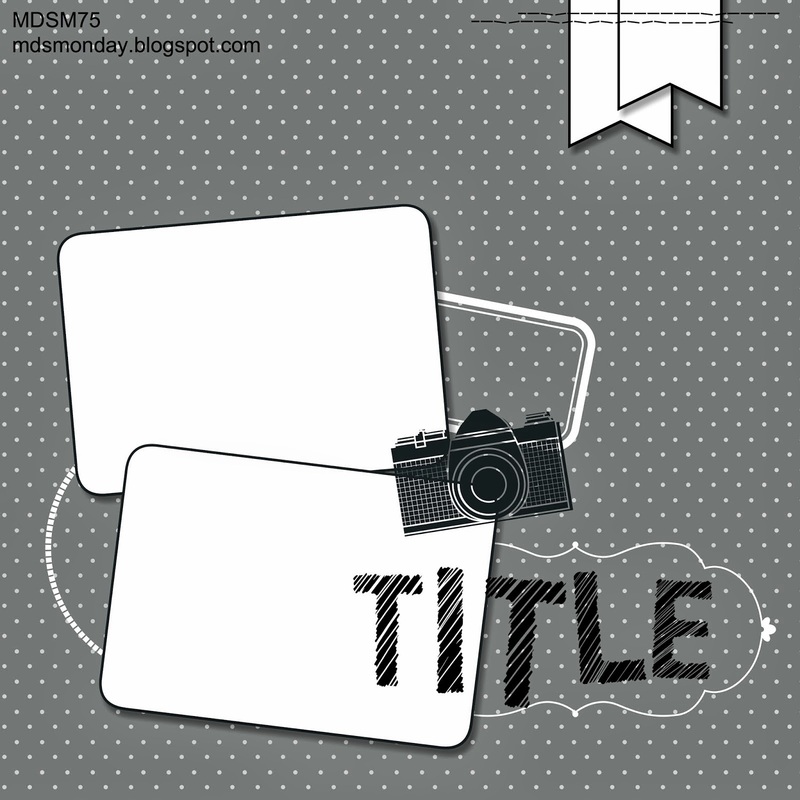 But on Saturday morning I remembered to check out this week's MDS Monday blog challenge, and what with the eastern time deadline, I didn't have enough time to participate. I posted my regrets on their Facebook page and this morning got a post response I could still play by posting my sample(s) there since the blog link was closed. Maybe these are too late to be official entries in the challenge, but I had fun creating them and they are looking for new members for their design team, something I would love to do! "SEND ME SOARING" - the eagle in the background is another of several photos I took of a statue in Camarillo, CA. I added the photo to the project, cropped and enlarged it to get the eagle image I wanted, then reduced the opacity to less than 20% and overlayed it on the background DSP. There are other low-opacity, overlayed background layers also - a texture, and a DSP page layer on the left with a torn right edge. 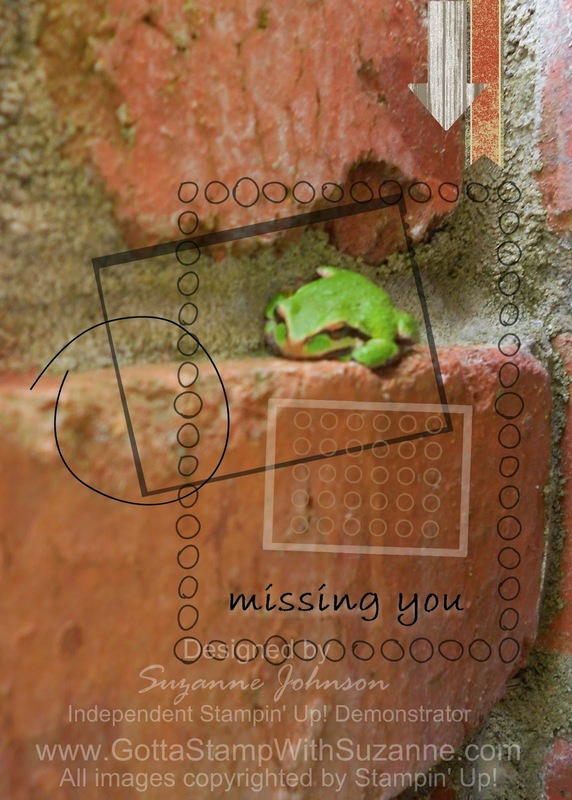 "MISSING YOU" features a little tree frog I who was nestled in the brick wall in front of our house. He looked so sad and lonely to me that I thought he was perfect for a "miss you" card. Very nice Suzanne! I especially like the sweet little frog, but then I always did love the Frog and Toad children's books. Glad you played along with our challenges and hope we see more from you at MDS Monday! Beautiful photos, Suzanne! I really love how you overlaid your eagle photo onto the background paper. The frames around the frog really bring out that photo. Thanks for joining MDS Monday! I love your eagle page! What a clever idea to add the image to your background. Great photos too! So sorry about the time mix up, but I'm really glad you still posted so we could see this great page! EXCLUSIVE NEW SET JUST FOR HOSTESSES! MDS MONDAY - A NEW CHALLENGE!